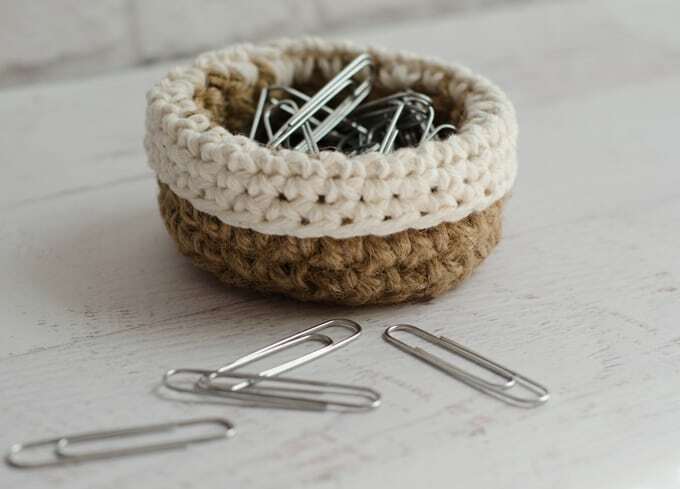 The other day I was looking at my crochet jute basket and the most brilliant upon brilliant idea came to me… what if I could make a teeny tiny mini crochet jute basket to hold my paperclips for work. You see, by day, I work for a school district. I have an ancient U-shaped desk that I’m 99.9% sure used to hold a typewriter. If you know anything about most school districts, you know that money is tight and any available dollar goes to educating students, not to outfitting the administration offices with fantastic desks or outrageous office supplies. As a result, my computer is at one end of the desk and the drawer where my paperclips are stored are way over on the opposite side. So I end up with little hills of paperclips near my computer that I have to scoop and shovel back to its proper location on a daily basis. I know.. real world problems. You know, just one of those little annoyances that isn’t quite bad enough for you to actually do something about but that just gets under your skin every time you have to deal with it. Until now. Until you are sitting in your living room on a Sunday morning and suddenly inspiration strikes! And VOILA! You create a work of art! A masterpiece! Brilliant! Ok. So maybe I’m way too excited about this, but I’m telling you…this took me hardly any time at all to make and it has changed my life! 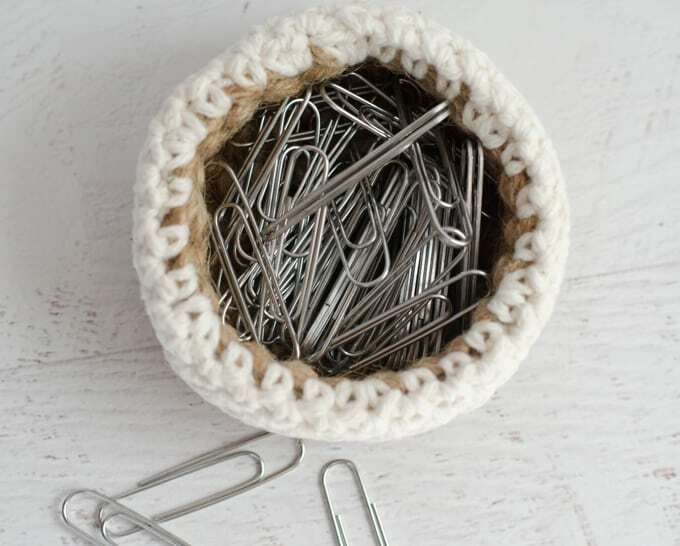 Or at least now I have a darling little basket for my paper clips that is so quiet and so darn stinking cute sitting on my desk. It makes me smile every time I see it. Let me tell you a little bit about this gem, this mini crochet jute basket. First of all, it is super fast to make. And if you made my jute crochet basket, you probably have enough yarn and jute twine left over to make this. 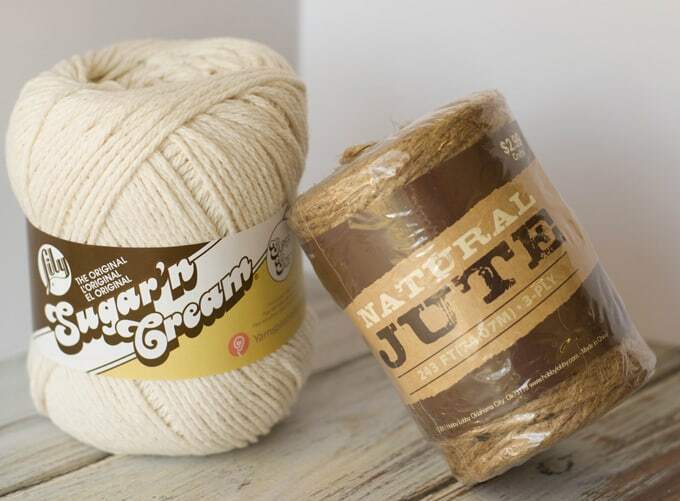 I will tell you though, that jute twine? Well, you’re about ready to become a jute twine basket wrangler. This basket is done in single crochet and a smaller hook size than my other basket. You’ll be pulling on the twine a bit and you’ll be oh so happy when you are done with the twine section and welcome the cotton yarn section. But it is so worth it. It makes up into a rather sturdy little basket that holds its shape well. I think you will like it. It would be great to hold other small things too–like jewelry, for instance. 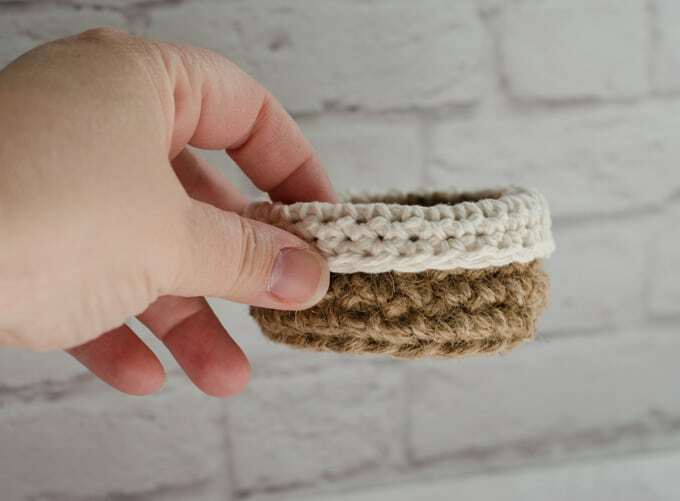 Fold over the cotton yarn portion to the outside to form a cuff over the twine basket. I love seeing your finished projects! If you share your Mini Jute Basket on Instagram, be sure to tag me @crochet365knittoo. If you are on Facebook, stop over to the Crochet 365 Knit Too Facebook page and share a photo! I’d love to see your work! Written pattern copyright Cheryl Bennett 2018, all rights reserved. Please do not reprint or repost this pattern. If you would like to share this Mini Jute Basket pattern with others, just link to this page. If you’d like to make items for sale from this pattern, please visit my About page for more information. That is so stinking cute! Thank you for the pattern. I will be making several of these.